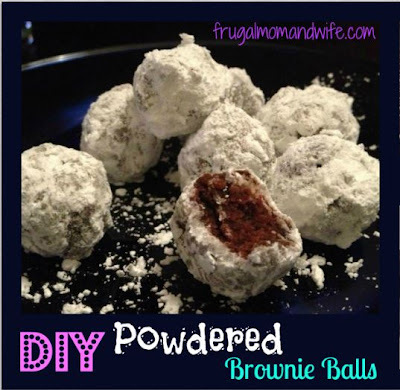 Frugal Mom and Wife: DIY Powdered Brownie Balls! I'm a sucker for anything covered in powdered sugar. Combined an addiction to brownies, I can get myself into trouble. These are so yummy and so easy to make! 1. Follow the directions on your brownie mix box and bake them. 2. Break up the brownies after cooled. 3. Roll the brownies into balls. 4. 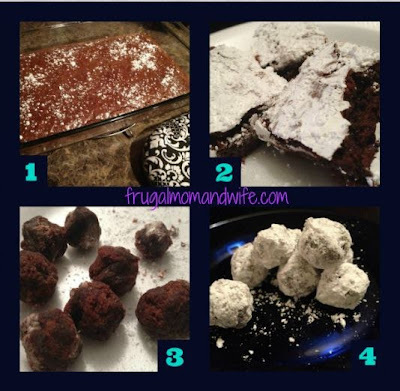 Roll the brownie balls into powdered sugar. You now have yummy Powdered Brownie Balls!! So easy to make and even more delicious to eat!! I just made these, thanks to you. They're really delicious and really livin up the typical brownie. I'm going to make them again this weekend for my friends baby shower. Darn, darn, darn---these sound sooooo good. If I make them I will eat them--now lets see if i can make them sugar free somehow or another. OMG my mouth is watering! Brownies are my fav dessert ever! gotta try these!